Katariina Perreault, 3, and Danielle Fracassi, 5, make friends with the Clay Pot Man in the Kids’ Garden. Photo by Pete Paterson. An elderly patient rests in a wheelchair beneath the arbor, his intravenous pole and oxygen tank at stark odds with the lush perennials, flowering bushes and trees. As the birds twitter, he seems to contemplate – perhaps on a life well lived or a healthy new beginning, or perhaps he is merely absorbing recuperative strength from the warm sun and serene environment. Whatever his thoughts, he seems at peace with himself in the gardens that wrap lushly around Orangeville’s Headwaters Health Care Centre, enjoying the opportunity to gaze across the beautiful views and inhale the fresh air – an opportunity that is all too rare for patients in most hospitals. A recent groundbreaking study funded by the Ontario Hospital Association’s Change Foundation has shown that patient disorientation and anxiety diminish when hospitals incorporate nature into their design. Mississauga’s Credit Valley Hospital is a successful example of “bringing the illusion of nature inside,” but HHCC is a step ahead of the curve, with the real thing right outside the door. 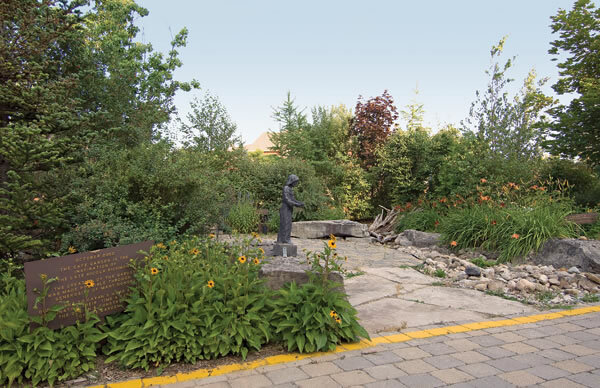 The gardens have come about through the diligent work of the “Friends of Headwaters,” a group of fifteen members spearheaded by Lynn Sinclair-Smith of Hockley Valley. Lynn, 62, had been a patient in the old Lord Dufferin Hospital when the community was raising money to build the new health care centre. 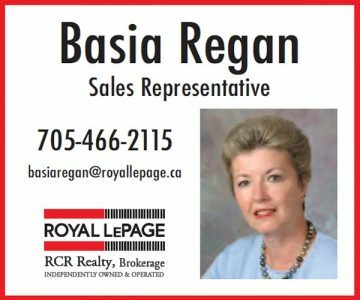 Deciding to help the cause, she formed the Friends of Headwaters, raising funds for hospital equipment and the critical care unit. The Fountain Garden was the first project completed by Friends of Headwaters. Photo by Pete Paterson. 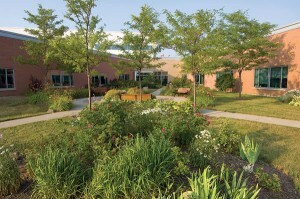 “However, the grounds surrounding the beautiful new building were terrible and barren,” Lynn says, “so our group decided to build the Fountain Garden.” By locating the garden between two of the triangular hospital wings, the idea was that patients would be able to view the garden from their beds. The group raised money by raffling off an old Mustang ($25,000), and by holding garden tours ($4,000), a golf tournament and auctions, among other activities. However, despite these successful events, there wasn’t nearly enough money – the cost of two door openers alone, necessary to access the garden, was $6,000. But the inaugural project was saved when money, plants and benches were donated by friends and family in memory of Roger Kedwell, who had recently died and was himself a good friend of the community. So, in 1998, a year and a half after the new hospital opened, the Fountain Garden was completed. It soon became a place of poignant memories. A wedding was arranged in the garden when the bride’s mother was too ill to leave the hospital. Her death a few days later left no doubt that the gardeners’ labours were well worth the effort. 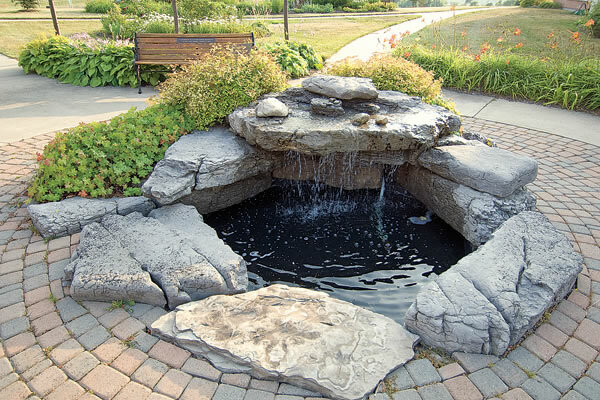 When people began to treat the fountain as a wishing well, tossing in coins, Ally took on the job of collecting the coins during her weekly visits. “I’d wash the money in bleach, round it up to dollars and return it to Lynn the next week,” she says. The gardens are a sea of cheerful colour from spring through fall. The benches have been donated in memory of loved ones. Photo by Pete Paterson. The work hasn’t been easy. Hard clay soil was carted away and the cost of compost and topsoil took a huge bite out of funds. Wind and road salt from Highways 9 and 10 are a continual battle. Currently Lynn is using funds from Scotiabank, the TD Environment Fund and private donations to purchase trees to create the Hill of Trees, to act as a windbreak and help clean the air of exhaust from the highway. Hardy trees, junipers and lilacs will be planted during the next several years as funds are received. Sue Orr and Bonnie Ledson donated many of the two thousand daffodils that dotted the slope this spring. Many of the original Friends of Headwaters continue to work in the gardens over a decade later. 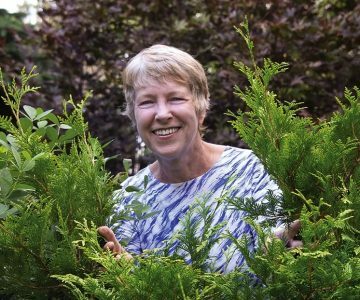 Anne Clark, 65, of Caledon loves to garden, following in the footsteps of her mother and grandmother. Some of the Fountain Garden’s first plants came from Anne’s mother’s home in Virginia. “Everybody has a favourite charity,” Anne says, “and the gardens are mine.” Anne has a staff of two for her own large gardens and occasionally brings them along to the hospital gardens to help out. 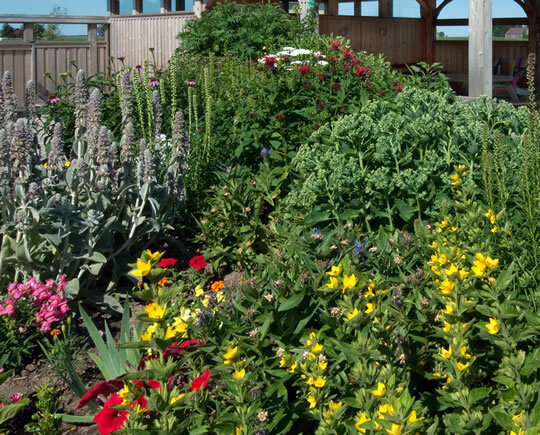 Anne and her husband, John, designed the garden by F-wing that overlooks the heliport, donating plants from their gardens. 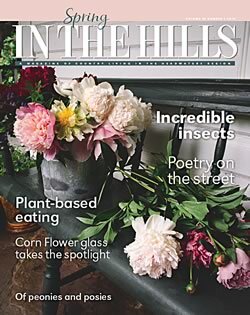 As an in-hospital volunteer, I entered a patient’s room in F-wing one spring morning to find a woman sitting in bed surrounded by gardening magazines. Outside her window, plants from Anne Clark’s garden were a profusion of lush colour. The Arbor Garden offers patients and their visitors a shady and intimate place to meet. Photo by Pete Paterson. 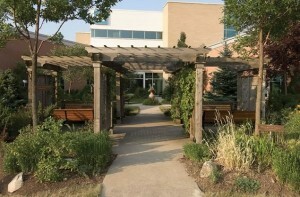 Realizing that many patients are sun-sensitive due to illness or medications the Friends built the Arbor Garden where patients can sit protected from the sun. Not long after the garden was completed, Lynn recalls a woman who, every evening, would wheel her mother and mother-in-law (both patients in separate wings) out to the arbor where they spent time together in the garden enjoying a little nightcap. Patients and visitors are not the only ones to take advantage of the gardens. According to volunteer Fiona Graham, doctors, nurses and other hospital staff regularly wander outside for a breath of fresh air or to clear their heads after particularly stressful operations. Fiona, 41, is one of the younger volunteers. A recent immigrant from Scotland, she decided to volunteer four years ago to meet people in the community. 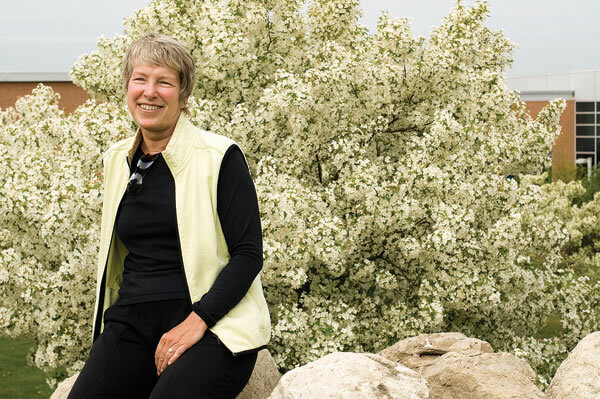 Through connections with other volunteers she now participates in a hiking group and curling club and her personal gardens benefit from the expertise of seasoned gardeners. “The gardens have given me a whole new life,” she says enthusiastically. Through the windows of the pediatric wing, a view of the Kids’ Garden softens the trauma for bedridden children. Originally built with funds donated by Ronald McDonald House, the garden was fenced and padlocked when Lynn and the group took over. She tore down the fence, asked for and received another $10,000 from Ronald McDonald House, and began the renovation. 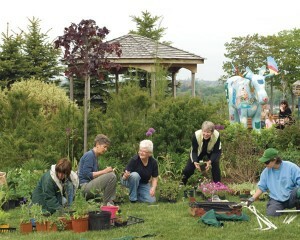 Volunteers (from left) Misha Dubbeld, Liz Knowles, Ann Davidson, Lynn Sinclair-Smith and Rebecca Muyal sort through donations for the annual spring plant sale – as Bruce McMoose looks on. The fundraiser brought in more than $3,ooo this year. Photo by Pete Paterson. A 150-pound fibreglass moose is one of the garden’s key attractions. Merlinworks, responsible for the 326 moose manufactured for a City of Toronto art exhibit, donated a portion of their labour costs to the hospital’s moose construction. It was named Bruce McMoose by Kali Martenns, 8, winner of the name-the-moose contest. Over Christmas, McMoose is draped with twinkling lights in tune with the season. Volunteer and gardening expert Liz Knowles and the Hockley Valley Garden Club have been a continual source of advice and support. Last summer Liz designed the newest xeriscape garden, visible along the hallway between the chapel and the cafeteria. Liz and her husband, George, installed drought-resistant ornamental grasses and perennials interspersed with hundreds of spring bulbs. Gardens now surround the hospital and many are connected by walkways. 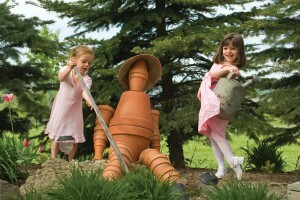 This year, the gardeners are taking on the task of revitalizing and upgrading the plants and the soil. “Initially we planted everything people donated just to fill the space, but now we want to get rid of some of the invasive plants,” Anne Clark told me, anticipating another busy season. 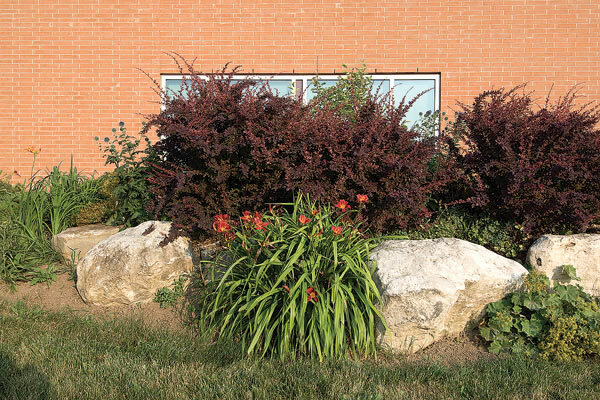 In 2005–2006 Lynn set her sights slightly farther afield, to transform the hospital entrance adjacent to the main parking lot. Lynn and then-CEO Bob Baynham conceptualized an area that reflected the natural rocks, trees and meadows typical of the region. Arborist Owen Goltz and landscape designer Karen Rosenbrock refined the concept to create the Healing Wheel of Trees. The charming Café Garden is accessible from the hospital’s cafeteria. Photo by Pete Paterson. The circular garden relates to the cycle of life, birth, death and rebirth and also relates to the natural cycle of the seasons. The garden is defined by a circular dry stone wall. Hundreds of tons of limestone were eased into place by volunteers under the tutelage of John Shaw-Rimmington, president of the Dry Stone Wall Association, and visiting Scottish wall expert Norman Haddon. Inside the circle, five large indigenous trees – white pine, sugar maple, oak, black walnut and ash – represent the area’s natural forest cover, with smaller flowering hawthorn trees dotting the outside perimeter. Friends of Headwaters raise their own funds and work independently of the HHCC Auxilliary which concentrates its impressive fundraising efforts and volunteer hours within the hospital. Lynn Sinclair-Smith has been the driving force behind the creation and maintenance of the gardens for ten years. “Her enthusiasm for life and for people keeps us invigorated and eager to continue,” says one volunteer. Photo by Pete Paterson. Lynn estimates that her group spent $18,000 in 2007 to purchase truckloads of topsoil, mulch, transplant trees, purchase new trees, repair the fountain, and to pay contract help. “My goal is to raise a minimum of $10,000 annually for basic maintenance of the grounds and gardens,” Lynn says. The group has raised more than $100,000 over the years, all of it going to build and maintain the gardens. 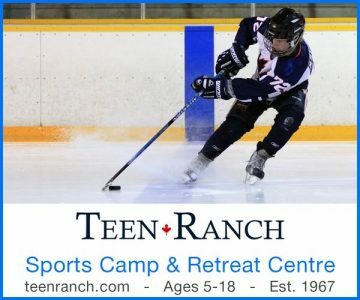 The list of those who have contributed to or donated equipment, concrete, gravel, benches, birdseed, plants and even a butterfly house are too numerous to mention, but Lynn and her team gratefully acknowledge every gift or discount. As every gardener knows, a garden is never finished and Lynn’s determination and vision has spurred the team on with energy and dedication. Friends of Headwaters meet for garden-work detail during the spring, summer and fall on Friday mornings and/or Tuesday afternoons (and often many other days). New volunteers, including students, are always welcome. The Tree Legacy Program is a way to remember a loved one or as a family gift. A $1,ooo donation allows people to dedicate an existing tree of their choice, with the assurance that the tree will be properly looked after and maintained.